Easy access to geographic information, possibilities of stylization and simple presentation of spatial data can considerably improve business processes and bring significant benefits. Specialized IT solutions based on Google Maps API can be used for everyday internal operations as well as for marketing and sales activities. Schedule a live demo with us! GeoTask helps to optimize tasks, routes and enables to monitor the fieldwork. GeoTraxx helps in planning and optimizing routes including real-time traffic data. GeoGrid makes your geospatial data accessible for your workforce and business users, from the office to the field. With GeoGrid, mobile teams have access to maps with data from GIS anytime on any mobile device. GeoMarketing allows you to optimize business and quickly respond to market changes by identifying untapped potential before the competition. 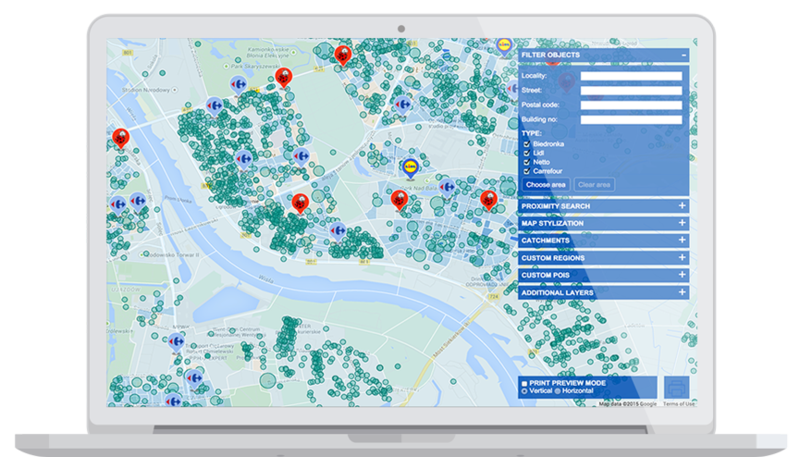 GeoLocator GeoLocator is a simple store locator platform, dedicated for visualization of any offices, shops, points of customer service, local entities. Street View inside your company headquarters. Business View is a unique opportunity to present your enterprise thanks to interactive 360 panorama. GeoEstate is a web application for real estate companies that supports on-line sales and lead generation by smart display of planned, on-going and completed investments.